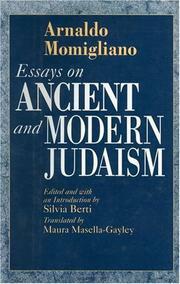  These 26 essays and two short reviews display the considerable erudition of one of this century's leading scholars of ancient history, Momigliano (1908-87) taught at the Scuola Normale Superiore in Pisa, as well as at the University of London and the University of Chicago, and these essays show his impressive scholarly range not only in history, but in such related disciplines as philology and sociology. Particularly interesting in the ``ancient'' section is a trio of pieces on Flavius Josephus, a first-century Roman sympathizer who also was the last major Jewish historian until the 16th century. Momigliano demonstrates that while Josephus, in his Against Apion, defended Judaism from heteronomous systems of thought, he gave short shrift to its more communal and religious, as opposed to strictly legal, aspects. In the modern period, Momigliano focuses more on German- than on Italian-Jewish history. He profiles and analyzes, among others, the 19th-century Jewish classicist Jacob Bernays (an ancestor of Freud's wife, Martha) and those exceptional friends who have had such a pronounced influence on 20th-century Jewish and western culture, Gershom Scholem and Walter Benjamin. Momigliano clearly writes for fellow scholars and very well read laypeople. While his prose is consistently clear and informative, it is sometimes difficult because of the considerable background knowledge he assumes. Still, there are a host of penetrating analyses here, such as a critique of Max Weber's portrayal of the Jews (in Ancient Judaism) as a ``pariah people,'' a concept later explored by Hannah Arendt. Berti's introductory biographical essay is superb. On balance, this is a substantial contribution to the disciplines of Jewish studies, history, and historiography.